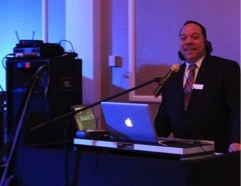 Entertainment Specialists brought good vibes and great cake to the Hyatt Regency Cambridge on Monday, February 6th! We hosted another amazing event to showcase our talented artists and amazing partners to local brides and industry professionals. 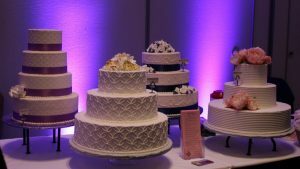 The event took place in the hotel's Grand Ballroom, along with showing off our services such as Dj's, Bands, uplighting and photo booths, we had a couple of our special vendors such as Boston Ballroom Dance Center and The Icing on the Cake. Boston Ballroom dazzled the crowd with their effortless moves across the dancefloor. While Icing on the Cake created a beautiful display of cakes for the crowd to see. They even had samples for the crowd to taste. The last band of the night was Sweet Tooth and the Sugarbabies, and they sure did bring the energy and the soul! They danced with members of the crowd while singing Lionel Richie’s “All Night Long” and soothed with Marvin Gaye’s “Let’s Get it On. Photo Booths are a must have at any event and attendees got to have a little fun snapping photos with props and taking home a photo strip to remind them of the evening! One lucky guest won a photo booth for their wedding! Guests entered to win other great raffle prizes and were rewarded at the end of the night. The next showcase is March 1st at the Boston Marriott Long Wharf from 6pm to 9pm - hope to see you there!